sportsmatrix » Where in the World is Mesut Özil? Where in the World is Mesut Özil? His deadline day transfer was hailed as the transfer coup of the year! The savior, redeemer and final piece in Arsenè Wenger’s puzzle to end Arsenal’s 8 year trophy drought! Mesut Özil arrived at the Emirates in a blaze of glory and based on his initial performances, it seemed that the Gunners were destined for glory. Forgotten was the 3-1 mauling by Aston Villa on the opening day of the season as Arsenal soared up the table and it was not long before Arsenal were top of the table and looking very much like potential champions. Teams were being swept aside as the Gunners played with a swagger not seen around the Emirates for many years. Everything seemed to be going smoothly until Arsenal visited Old Trafford. The week before the United game, they had comfortably beaten Liverpool to open up a 5 point gap at the top of the table. With this behind them, they could sense blood against the ailing champions but this is where it all went pear shaped. United went on to win that game courtesy of ex-Gunner Robin Van Persie’s 27th minute header. For all the hype before the game, Özil was largely anonymous which prompted the internet to be flooded with Özil related memes. It has been subsequently claimed Özil has a tendency to go AWOL in games against big teams. Of course an internet meme certainly is not lore and we decided to see if the stats back up this claim. 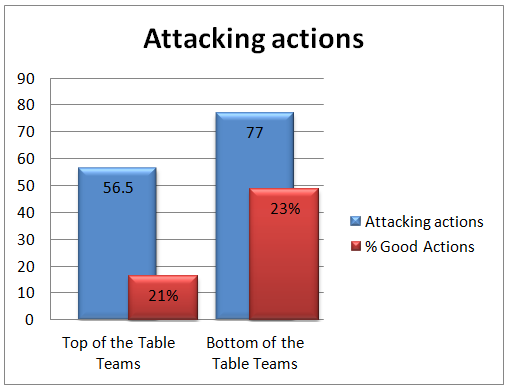 We took Özil’s games against the other top of the table teams in the Premier League at the moment – being Chelsea, Manchester City and Liverpool (home and away) and compared them to his performances against teams at the bottom of the table – those being Fulham, Cardiff, Sunderland and Norwich. It goes without saying that Özil’s role in the Arsenal team is dominated by the building of attacks that ultimately end with either a shot on goal or better yet, a goal itself. In line with the many internet meme’s out there, Özil is, in fact, involved in fewer attacking actions against the top of the table teams than their bottom of the table counterparts. We then looked at his actions when breaking both the first and second line of defence. How did we define the first line of defence? This is an action by a player that allows him to either move past or pass the ball beyond the opposition strikers and forward players. 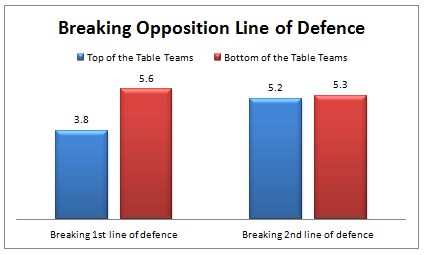 The second line of defence is when the player bypasses the opposition midfield players and gets the ball into a position from where a chance on goal could be created. As can be seen, Özil was far more successful when it came to breaking the first line of defence against the bottom teams although his stats for breaking the second line of defence are almost identical. Now that we have moved past the second line of defence and into a position whereby a chance could be created, we look at Özil’s actions when it came to Chance Creation. Here we saw a significant drop against the top team in both the number of attempts to create a chance as well as the number of chances created. It could be that he came up against better defenders in the top teams and thus his numbers would be lower. 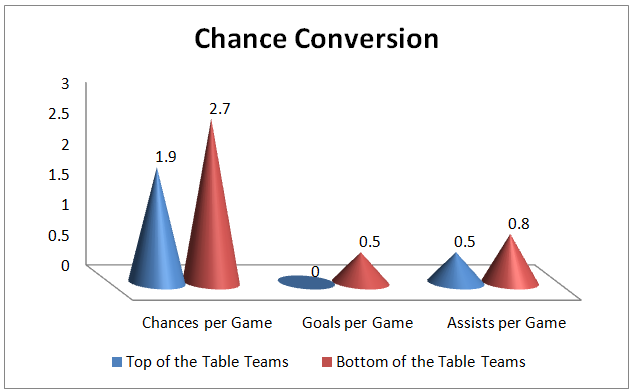 When it came to Chance Conversion, we saw that he was also more effective against the bottom teams. He had more chances against the bottom teams which in turn led to him having more assists and goals. He is not a player who takes shots on goal and whilst he did try shoot a similar number of times in games against both top and bottom teams that only came to an average of 1.1 shots per game. Whilst the number of shots was the same, he managed to score 2 goals against the bottom teams with no goals against the top teams. It is safe to say that he did perform better, overall, against the bottom teams than he did against those at the top of the table. As stated above, a lot of this could have to do with the kind of player that he came up against when playing the various teams. Perhaps he is also being judged a little unfairly with the massive weight of expectation based on years of disappointment being placed on his shoulders by the Arsenal fans. With the Gunners still to play Chelsea and Manchester City in the next month, it will be interesting to see if Wenger plays him in those crunch ties and if so, will Özil turn up. « Will Olympiacos Send Manchester United to Hades in the Underworld?